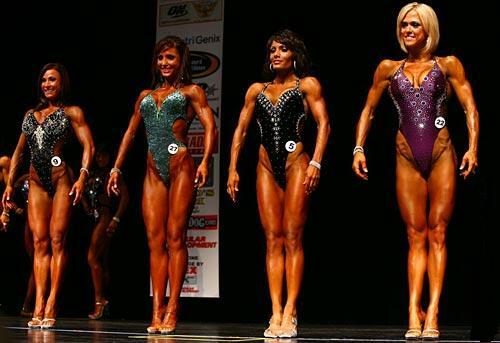 Finally on 30th October holds IFBB PRO Figure competition and we have the hot five winners. 20 beautiful competitors take part in this event. On the first position was classified Teresa Anthony. Second position was taken by one of the most famous fitness models and softball champions of USA – Felicia Romero. Ava Cowan classified on the third place. On the 4th and 5th position were ranked Deena Walsh and Kristin Nunn. Two more rookies came to Detroit for the last IFBB Pro Bikini contest to qualify for the 2010 Olympia, and they both garnered the top spots. Noemi Olah from Hungary blew away the competition, and could be a very serious contender for the top six at the Olympia next week. Christy Merritt also wowed the judges, and Dina Al-Sabah, after improving at each contest, garned the last qualifying spot for the Bikini Olympia. Congratulations! Davana Medina, on her first pro contest as a bikini competitor, placed 5th, still a little too muscular but quite impressive. Less than one week before the Olympia begins, and we have two more IFBB competitions, with the top three in each able to qualify. Here are the competitor lists. The 2010 IFBB Tournament of Champions took place in Culver City, California over the weekend. Promoter, Jon Lindsay did another tremendous job with this contest which was held in conjunction with a NPC event. It was refreshing to see a large turnout (18) from the pro bikini competitors. The top three women qualified for next weekend’s first ever Bikini Olympia. Sonia Gonzales notched her third win in the bikini division. Her only loss was in Pittsburgh to Nathalia Melo. Rookies Brooke Mora and Anca Marcus both qualified in their first pro shows. This Saturday, 18 IFBB Bikini Pros will take the stage at the IFBB Tournament of Champions held in Culver City, California. The show is the second-to-last competition for those hoping to lock in a spot in the first Bikini Olympia. There are a number of women making their pro debuts and a few familiar names. Dina Al-Sabah has steadily improved with every show and has found her way around the new division. She teamed up with TEAM BOMBSHELL a few weeks ago and the results have paid off. Look for her to be one of the names called out in the top five. Jennifer Celeste will be making her pro debut. She turned pro at the 2009 NPC JR Nationals and has good bikini physique. Since we haven’t seen her on stage in over a year it’s a roll of the dice on what her current physique looks like in a bikini. Jennifer is currently living in Los Angeles and has the added advantage of not having to travel. 300lb Kai Greene Guest Posing at the 2010 IFBB Jacksonville Pro! Read more300lb Kai Greene Guest Posing at the 2010 IFBB Jacksonville Pro! Here are the results from the three IFBB Pro Contests held in Jacksonville, Florida on Saturday, August 7th, 2010. The ’10 IFBB New York Pro Figure (and NPC Team Universe and Fitness Nationals) got off to a big start last night in Hackensack, New Jersey. From the callouts and photos it appears that Cheryl Brown, a 38-year-old mother of three who’s had a sensational string of top-three finishes since turning pro last summer at the IFBB North American Championships, is on tap to score her second win. Also that Terri Turner and Gennifer Strobo could be nabbing the other two Olympia-qualifying spots.